Harry Potter Inspired LABELS! 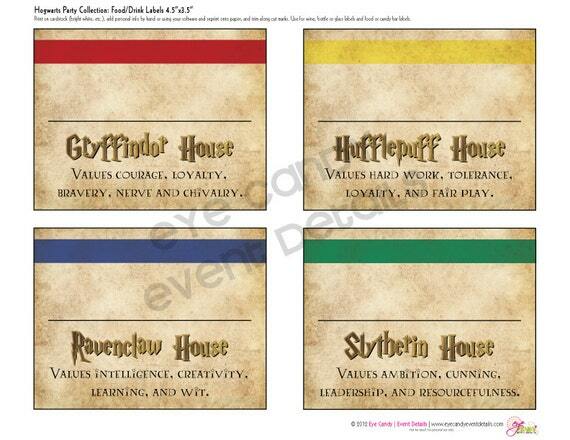 that comes from the PRINTABLE Harry Potter Inspired Party Pack collection I offer in my shop in a separate listing. Need MORE Harry Potter decor? Or an INVITE? Files will be sent to the email address provided on your etsy account. Once we receive payment, you will receive them VIA EMAIL as an INSTANT DOWNLOAD for YOU to print yourself. Please contact us for customizing of ANY of the items in our shop for an additional charge. ***Any color, wording or design changes will be charged an additional fee & are NOT included in this price. Please contact us to set that up. **PLEASE NOTE: This file is for personal use only. Do not forward, share, sell or distribute this file. It is for non-commercial use ONLY. Eye Candy Creative Studio reserves all rights. *** By purchasing this listing YOU are agreeing to these terms.